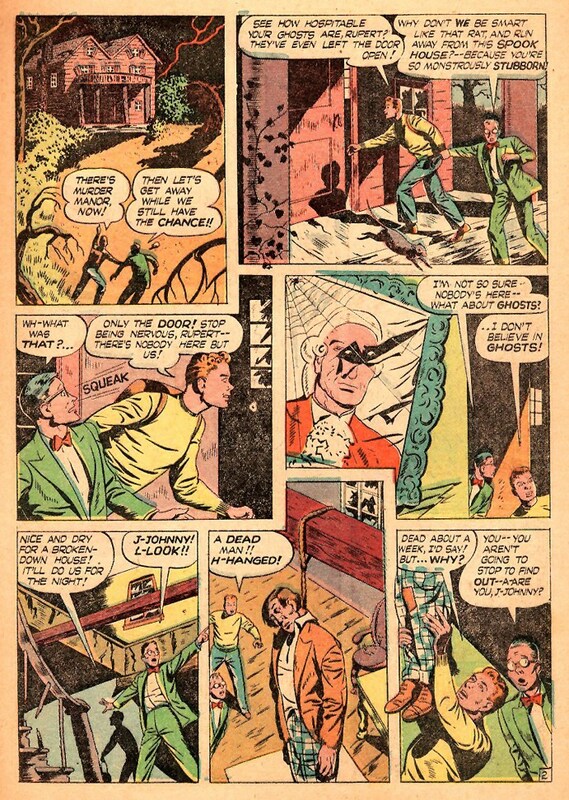 Horror comics play an important part in the history of the American comic book, not the least because they are directly associated with an event which scared and haunted the comic book industry in a very real way - the April 1954 hearings of the US Senate's subcommittee to investigate Juvenile Delinquency. 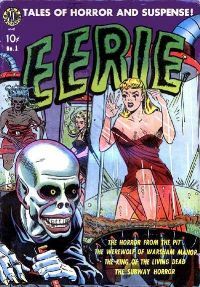 This essay examines in detail the first American horror comic book, Eerie Comics #1, published in 1947 by Avon Comics. 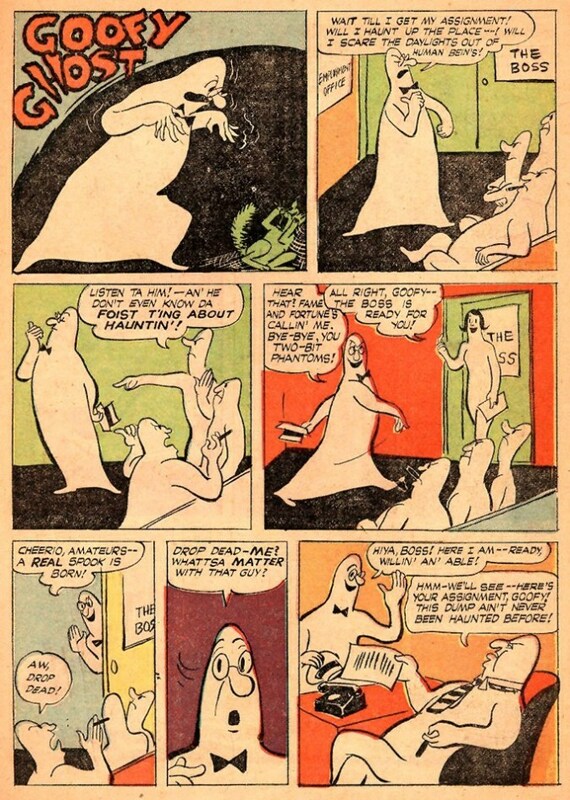 Just when exactly the first American horror comic book was published is the object of some debate (Watt-Evans, 1997), but as often all hinges on the question of definition. 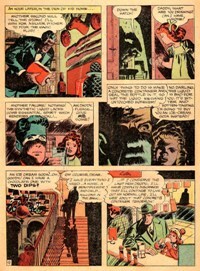 For the purpose of this review and analysis, a "horror comic book" is taken to be a comic book featuring horror content only which is presented in material originally conceived for the comic book medium. 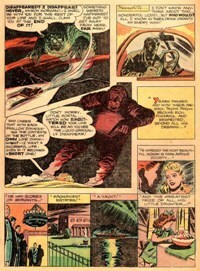 This defintion thus clearly rules out Crestwood Publication's anthology title Prize Comics #7 (December 1940) - which is generally taken to feature the first appearance of true horror (Goulart, 2001) - as the recurring 8-page adventures of the Frankenstein Monster were de facto submerged in the otherwise exclusively superhero themed content of Prize Comics. 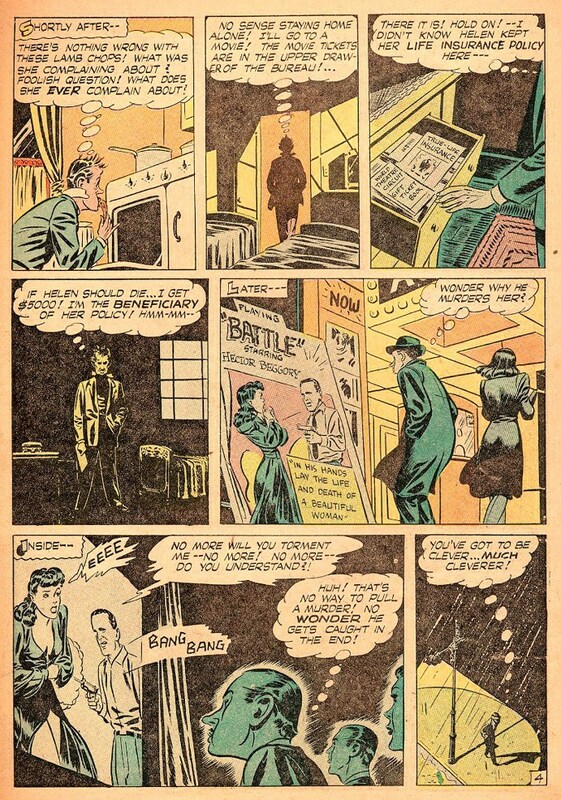 Another candidate to be dismissed is the Gilberton Company's Classic Comics #13 (August 1943) which featured an adaptation of R. L. Stevenson's Dr Jekyll and Mr Hyde. 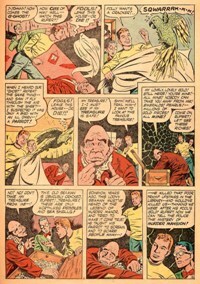 Although this is the first American comic book to feature only horror genre content (Goulart, 2001), it did not feature original content produced especially for the medium. As a consequence, both titles (along with others, e.g. 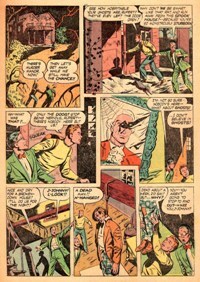 the "Famous Tales of Terror" feature in Charlton's 1944 Yellowjacket Comics) can only be seen as precursors to the first horror comic book: Eerie Comics #1, published in January 1947 by Avon Comics. 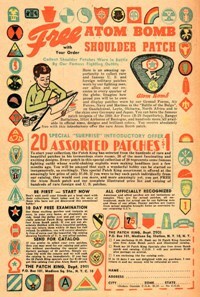 An imprint of Avon Publications, this small business was located at 119 West 57th Street in Midtown Manhattan and was basically run by siblings Joseph and Edna Myers since 1941, when the American News Corporation bought their pulp magazine publishing company and renamed it Avon Publications. 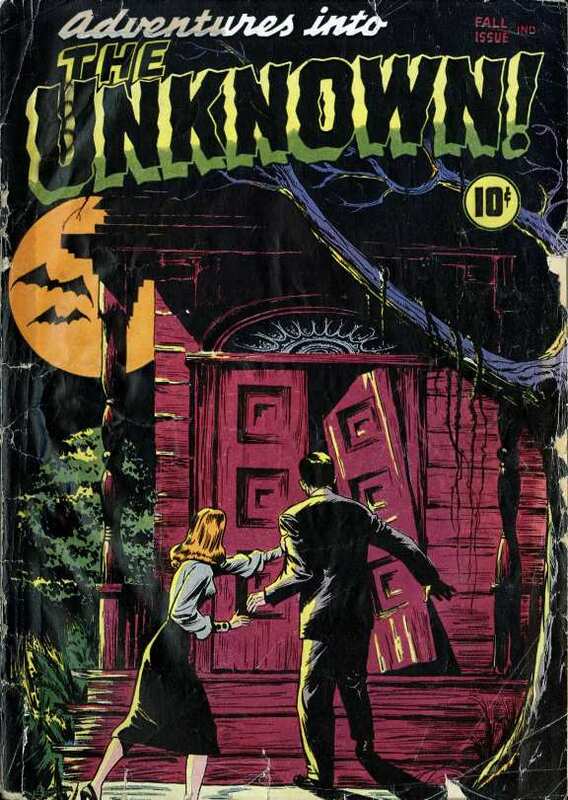 The basic business idea was to get a foothold in the paperback publication market, and Myers built on his previous pulp fiction publishing experience to pursue a policy which aimed at having a distinctly "popular appeal" rather than striving for any literary merits. 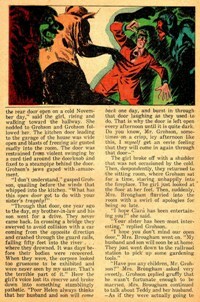 As a consequence, Avon predominantly published ghost stories, sexually suggestive love stories, fantasy novels and science fiction in its early paperbacks. 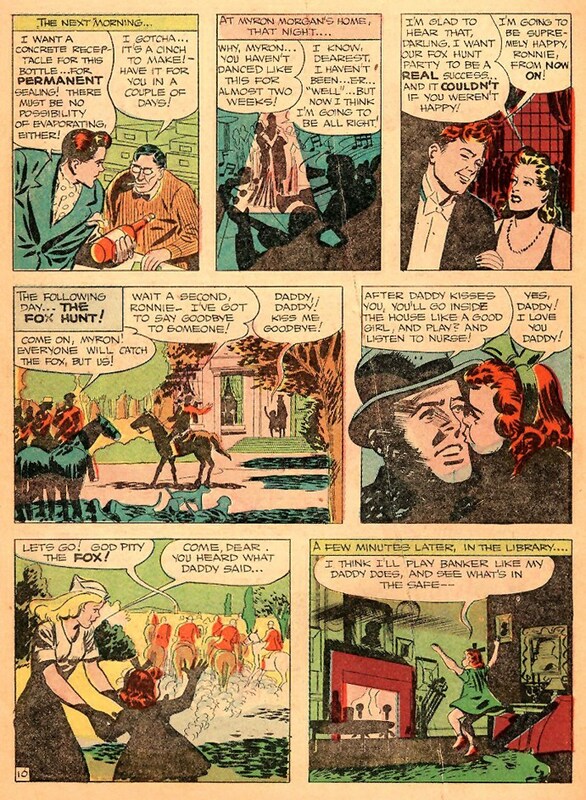 Myers and his sister knew their trade, and a number of acknowledged authors such as Raymond Chandler, Robert E. Howard and James M. Cain had stories published in Avon's titles such as Murder Mystery Monthly, Modern Short Story Monthly or Avon Fantasy Readers (Canja, 2002). 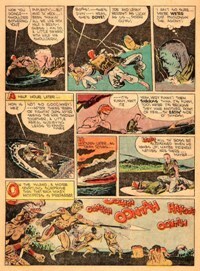 Looking for new market segments to touch upon, the Myers found the by now well established medium of comic books beckoning (Canja, 2002), and Avon tested the waters in 1945 with Captain Silver's Log of the Sea Hound #1. 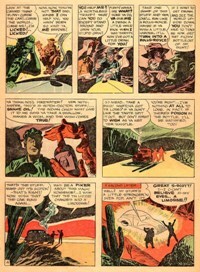 As with many Avon titles still to come, many would never see a second issue, but after a short hiatus the Myers were back for more and, in January 1947, launched Eerie Comics, an original material horror-only comic book, and Cow Puncher Comics, a Western title. 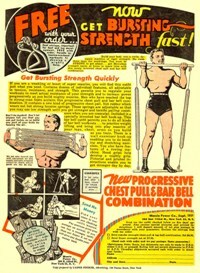 These were followed later on that same year by The Saint, Penny (a Romance title) and Peter Rabbit Comics. Whilst the imagery on the cover of Eerie Comics #1 - a red-eyed and dagger-toting ghoul threatening a rope-bound and scantily clad young woman - clearly suggests terror in torture chambers in the tradition of the pulp fiction magazines rather than haunts of horror in the tradition of Gothic fiction, the anthology title actually offered six stories in its 52 full-colour pages which were fairly tame in their visuals and contained only horror content rather than pulp fiction motifs. 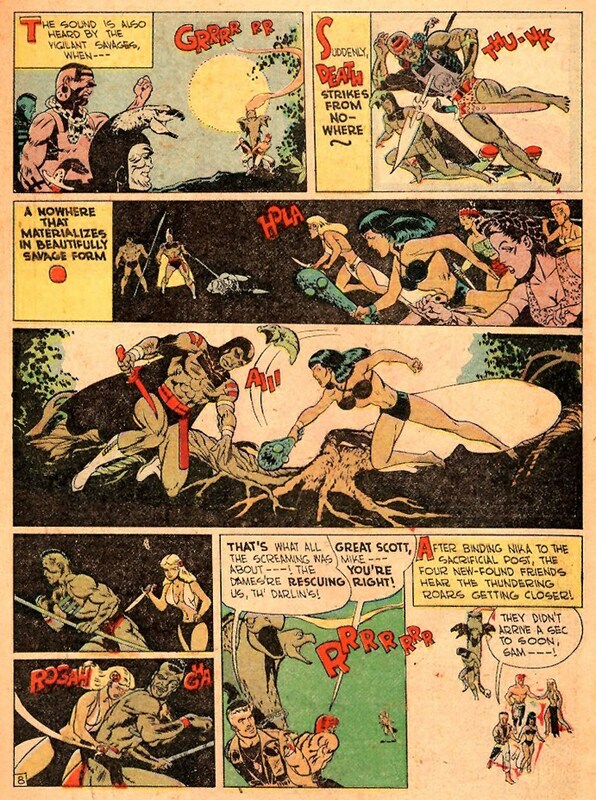 The comic features no editorial content, and whilst none of the writers is known, the artwork has been attributed to Joe Kubert, George Roussos and Fred Kida (Goulart, 2001), who later on would all become household names in the industry. 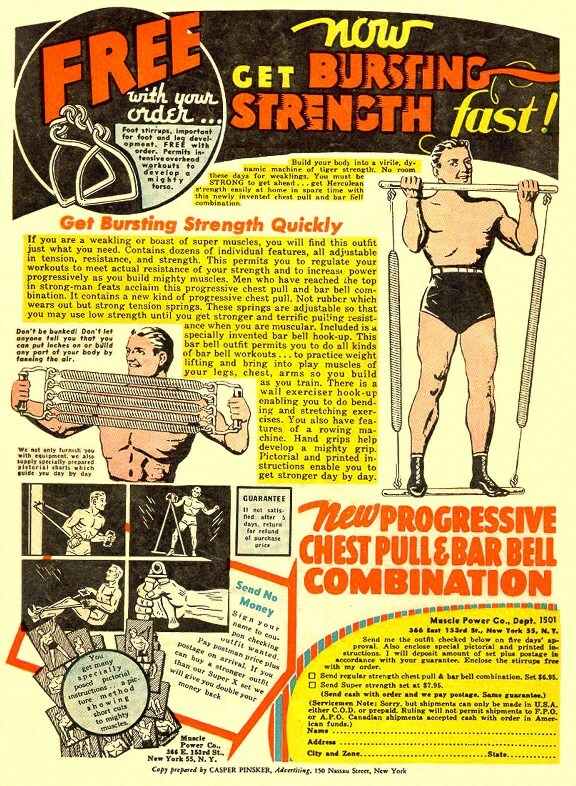 Avon Publications was bought by the Hearst Corporation in 1959, but whilst the paperback division was an ongoing success story, Avon's comic books - which had never enjoyed a large amount of sustainability in any case - were left by the wayside. 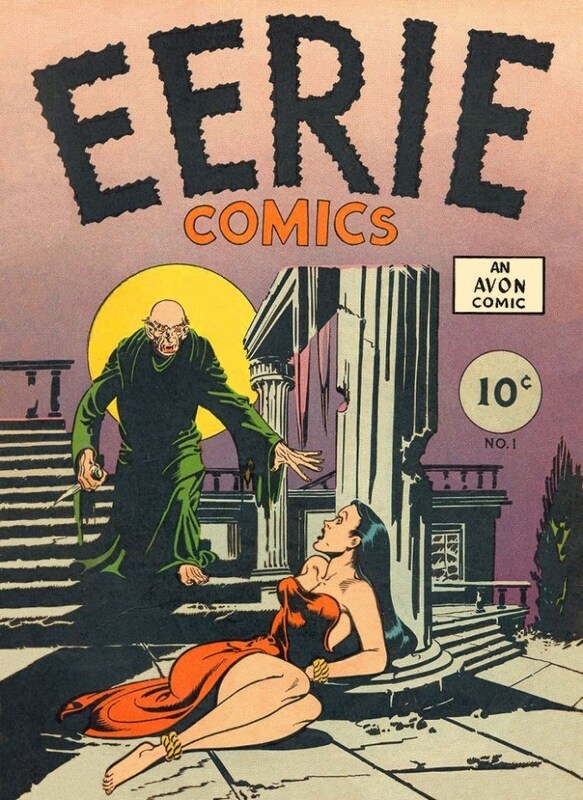 As a consequence, the copyright for Eerie Comics #1 was not renewed in 1975 - which puts it in line with the vast majority of printed works published in the United States before 1964 which were also never renewed for a second copyright term (Fishman, 2008). 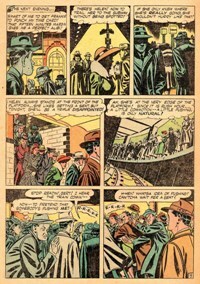 According to the regulations of the US Copyright Office on the duration of copyright and the length of copyright protection (Circular 15a), Eerie Comics #1 is therefore in the public domain, allowing full reproduction below (click on thumbnails for larger images) as illustration to the review and analysis. Carl Cattler loved beasts of the feline stripe, and they returned this affection... for the most part. Everything was lovey-dovey until Carl made one serious mistake! After that, he saw nothing but the "eyes of the tiger" ! 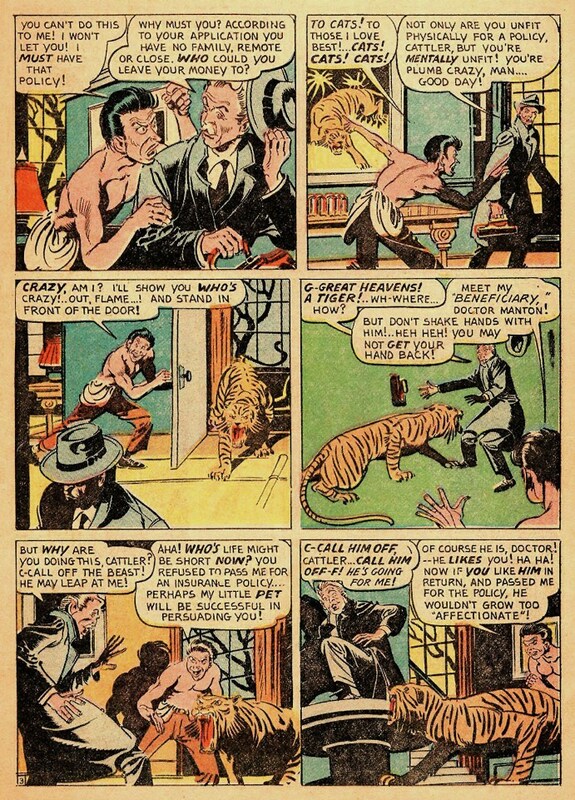 Doctor Manton is required to make an insurance policy health check call at the mansion house of a certain Carl Cattler, whose reputation of being an eccentric cat lover is quickly confirmed to the Doctor when he finds a stuffed tiger on display in the front lawn. Worse still, a preliminary examination of Cattler's heart reveals this to be in such a bad condition so as to "blow like a fuse under the slighest of strain". 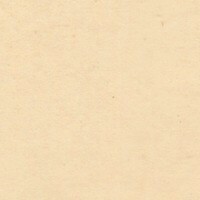 Naturally, Doctor Manton refuses to pass Cattler's application for a policy. The outraged eccentric tells the medic that he simply must have that policy in order to secure enough money for this beloved cats after his death. 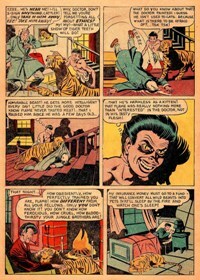 When Manton tries to hurry out of the house, Cattler calls his tiger "Flame" into the room and threatens to unleash the animal on the horrified medic unless he changes his mind and signs a pass for the insurance. When the Doctor faints Cattler is quite amused by the fact that Manton completely misjudged the animal which was raised by Cattler who considers the beast to be as tame as a kitten. 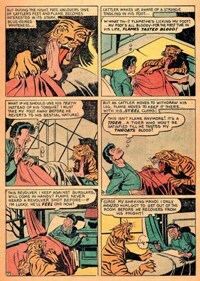 Night falls, and whilst Cattler is asleep his pet tiger begins to lick the eccentric's uncovered foot. This arouses Flame's wild instincts, and as Cuttler awakes he realises that his pet is just now turning into a ferocious and bloodthirsty wild beast. 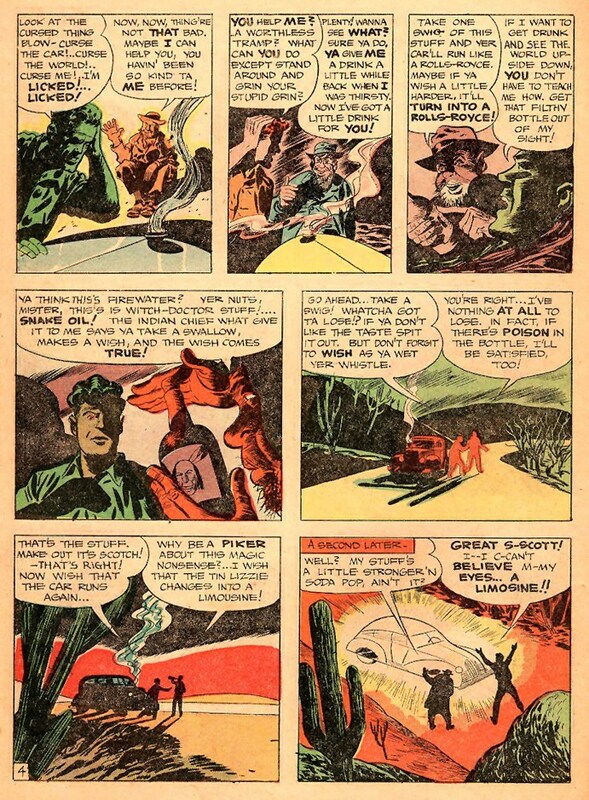 He tries to save himself by shooting the animal with a revolver but is so scared that he misses his target with his trembling hand. 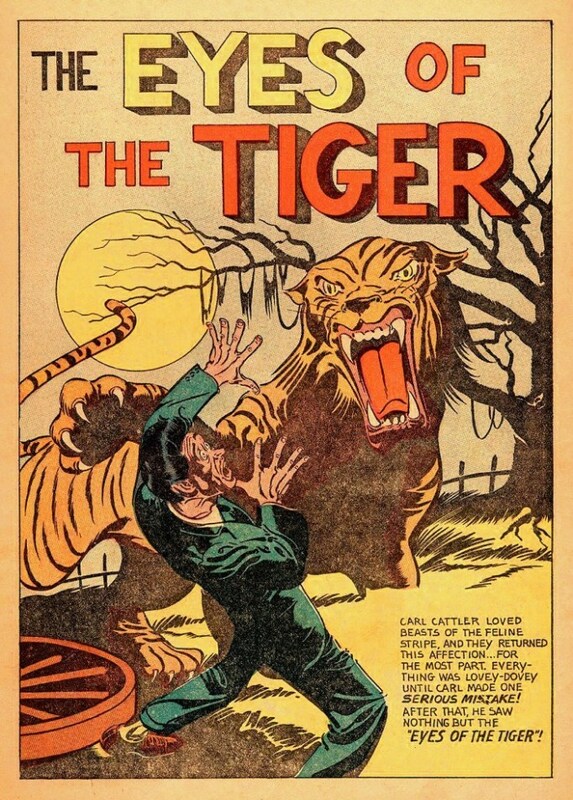 Frantically, Cattler seeks to escape the beast by making a run for it, but just as he reaches a safer room on the upper floor the tiger, who has now completely turned from pet to a bloodthirsty wild animal, is upon him again. Unable to close the door behind him, Cattler again fires at the beast, this time at close range and right into the head, and after firmly slamming the door Cuttler remarks the animal's blood seeping in underneath the door. 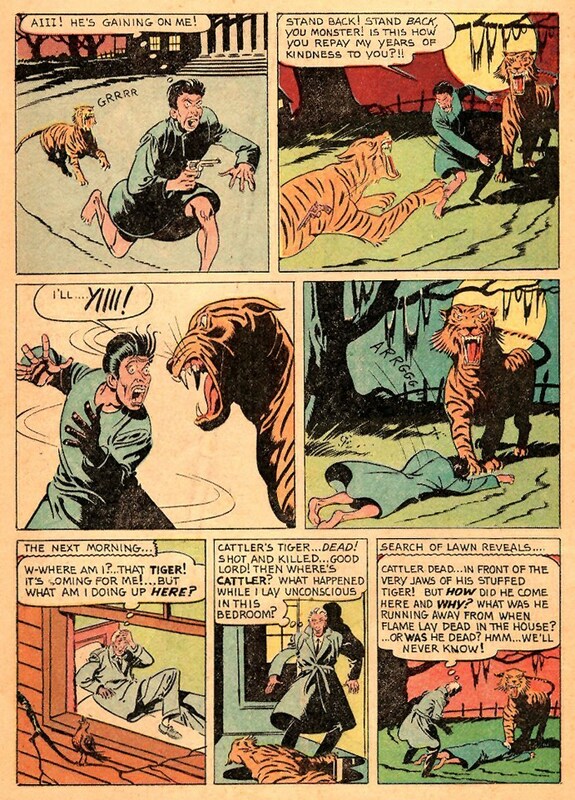 However, his relief is shattered instantly as Cuttler now sees the tiger's pair of eyes everywhere in the dark, and suddenly even the tiger himself appears - the beast appears to be invincible, even immortal. 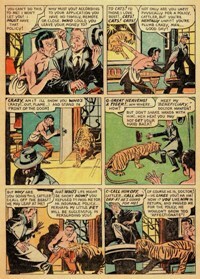 In panic, Cuttler jumps out of the house but is still followed by the tiger as he fires the last bullets from his gun. As Cuttler runs into the garden grounds the sight of the stuffed tiger is too much to bear, and he falls to the ground. "Cattler dead... in front of the very jaws of his stuffed tiger! But how did he come here and why? What was he running away from when Flame lay dead in the house? ... or was he dead? This 8 page opening story - which was reprinted in Avon's Flying Saucers #1 in 1950 - is based on the popular plot tool of having a villainous trapping eventually backfire and work against the person who has set it up in order to gain advantage over somebody else - as illustrated, for example, in Shakespeare's Hamlet, where King Claudius tries to poison Hamlet but instead ends up poisoning the queen, and Laertes puts poison on the tip of his sword which he uses to kill Hamlet only to be stabbed himself with that very same sword, thus dying of his own poison. 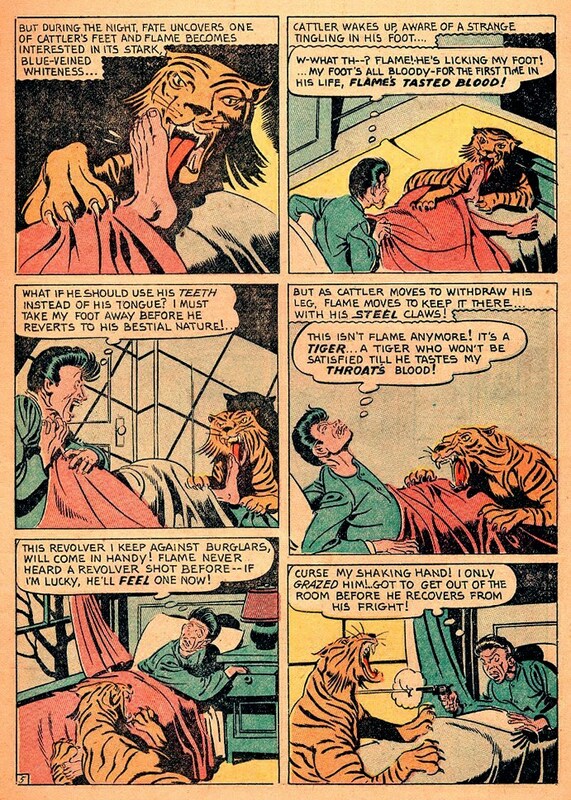 In the case of "The Eyes of the Tiger", Laertes is Cuttler and the poison-tipped sword is a tiger called "Flame" as the eccentric looking to secure an insurance policy scares Doctor Manton with the threat of unleashing his tiger upon him, even though Cuttler fully knows that the animal is quite harmless. However, precisely at this point the pet tiger transforms into a wild beast, and the fabricated threat and danger become reality and fall back upon Cuttler himself. Having made the Doctor believe that death was an imminent threat, Cuttler now dies himself. 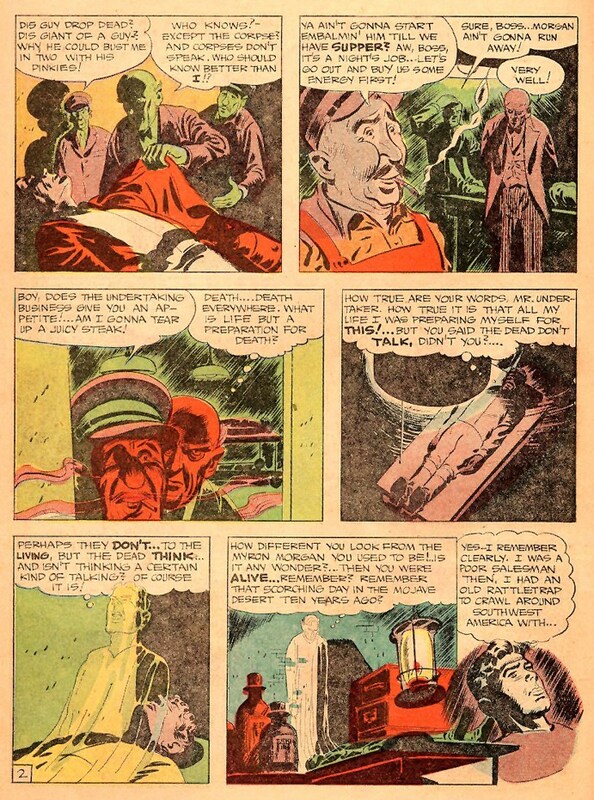 Neither the author nor the artist of "The Eyes of the Tiger" are known, and the first horror story in chronological order in the first all-horror comic book thus echoes the lack of secure information which the story itself relays to the reader. 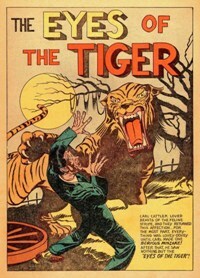 Whilst not featuring classic props of gothic horror to a large extent, the plot nevertheless contains the minimal markers needed to set both the picture and the mood, most noteably by using a large and lonely house as locale and what must be assumed to be the ghost of a tiger as spooky actor. By no means a masterpiece, the ancestry of many 1950's and 1960's horror stories can most certainly be traced to "The Eyes of the Tiger". "Death... Death everywhere. What is life but a preparation for death?" Myron Morgan simply dropped dead one day whilst taking part in a fox-hunt, and now his tall body is laid out in an undertaker's establishment. But before any further work in preparation for the burial is carried out, the owner and his two assistants have a break and go off for a meal, even though the undertaker is preoccupied with rather sombre thoughts - "Death... Death everywhere. What is life but a preparation for death?". At this point the readers notice that the dead Mr Morgan not only seems to be thinking to himself, but that he also seems to be able to "hear" the thoughts of living men - and the reader is about to learn that the Dead don't speak (at least not to the Living), but they move about as ghostly apparitions - and most of all, they think. The magic drink only seemed to have one negative aspect - the day that there would be nothing left in the bottle to drink would be the day the owner of the bottle dies. Hardly listening to the tramp, Morgan imagined all the things he could do with that bottle, and at that point plain greed began to take hold of him. He refused to give back the bottle, and when the bum kept on protesting decided to get rid of him by running him down with his car. 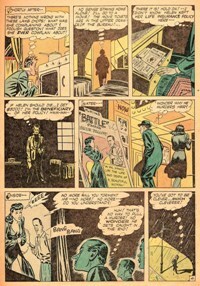 However, when Morgan checked to see if the old man was really dead, he found that the tramp had vanished - or had he? The reader, unlike Morgan, realises that the old man has turned into a ghostly figure, looming large over the scene of Morgan's hideous crime, and vowing to claim the salesman's life when his time will finally be run. Sensing that something strange is afoot, Morgan throws everything to the wind with the prospect of leading a good life, and indeed, as the years go by he married a beautiful society girl, had scores of servants, magnificent estates, a yacht and, last but not least, a little daughter. But Morgan quickly discovers that the newly distilled liquid lacks the magic properties of the original Indian snake-oil, and he thus decides to protect its few remaining drops by encasing the bottle in a concrete casing, an order which he is told will be ready in a few days' time. This second story runs for 11 pages and contains another well-known motif as the core of its plot: the ethic of reciprocity. Also known as the maxim of the "golden rule", this ethical code has its roots in a wide range of world cultures and reaches far back into mankind's history of reflecting on morality and philosophy. Quintessentiality it stipulates the positive rule that one should treat others as one would like others to treat oneself, although its negative form is known just as well and used just as frequently, i.e. do not treat others in ways that you would not like to be treated yourself. The positive rule can be found in texts reaching back as far as the story of the Eloquent Peasant from the Middle Kingdom of Egypt (Wilson, 1956) or the biblical parable of the Good Samaritan, whilst the negative rule can be found in admonitions attributed to Confucius as well as many religious texts (Kidder, 2003). 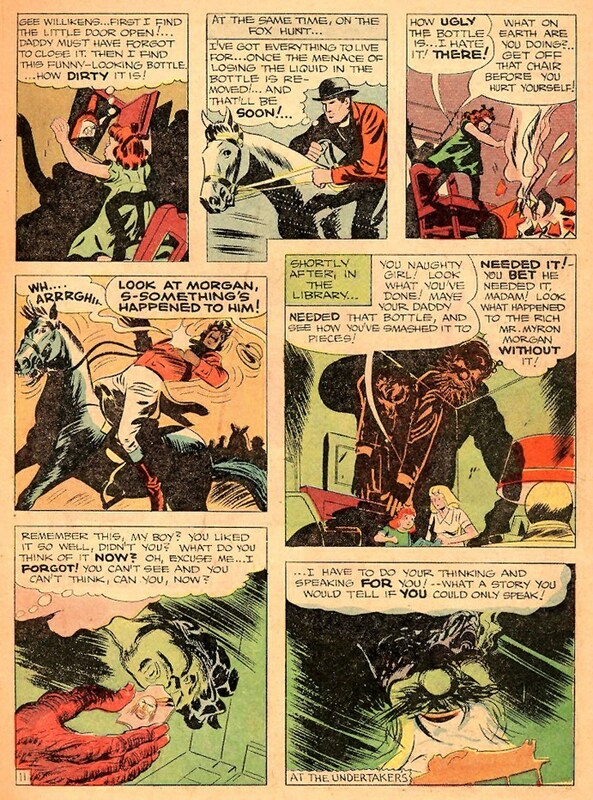 In the case of "The Dead Man's Tale", it is evidently clear that Myron Morgan not only blatantly and repeatedly violates the golden rule of reciprocity, but he does so out of pure selfishness and will stop at nothing. Instead of repaying the kindness of the old tramp by showing modesty and content with having one or two wishes come true, Morgan wants it all for himself, and in order to secure this he not only steals the magic potion but also tries to do away with its previous owner in order to counteract any future problems regarding ownership quarrels. 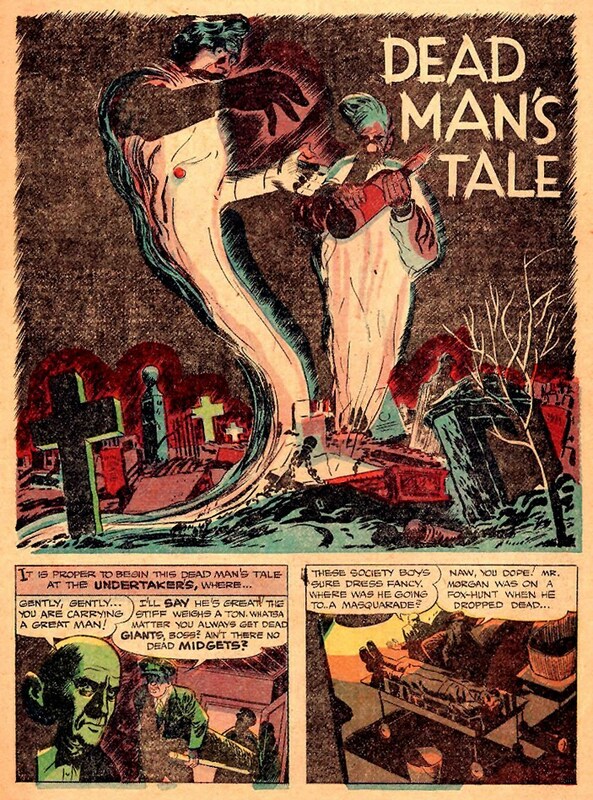 Basically a tale of morals (and possibly crime fiction), the horror element is introduced right at the beginning with the scene at the undertaker. The reader knows that something spooky is going on here, and from here on he is systematically ahead of the protagonist of the story, including the insight that the old tramp is not what he seems to be and certainly a figure not to be messed about with. Myron Morgan, however, is partly unaware of the certain path the reader knows that all events will ultimately take in order to seal Morgan's cursed fate, and the story generates its interest and suspense from this setting. It is clear that Morgan will fail to cheat the old bum for ever, but what will finally trigger his downfall is unclear and thus keeps the reader guessing for a while. Fairly typical for this kind of moral talk of horrors is the irony which is infused in the way the final curtain falls. As pointed out, the reader is virtually always ahead of the protagonists of the story, but one point remains undisclosed: the actual nature of the tramp. Certain aspects seem to hint at him being the devil, but the unkown author ultimately leaves this to the reader to decide. If the old man were indeed the devil then another aspect comes into play: was Morgan a victim of temptation, targeted so devilishly clever that he never stood a chance? Did he truly have a choice? Could he have acted in accordance to the golden rule and overcome his personal greed and selfishness, or was the Devil just playing with him right from the start? 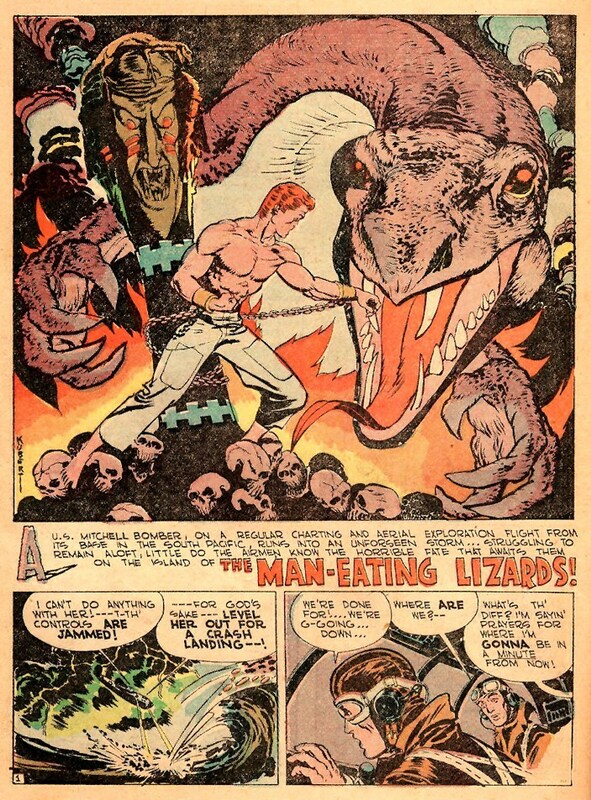 "A US Mitchell bomber on a regular charting and aerial exploration flight from its base in the South Pacific runs into an unforeseen storm... struggling to remain aloft, little do the airmen know the horrible fate that awaits them on the island of the man-eating lizards!" 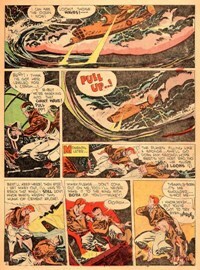 It is a ghastly storm that the crew of a bomber find themselves in, and unable to hold their plane they crash-land at sea. The three surviving airmen manage to climb aboard one of the torn off wings of the aircraft and await their fate. Things look set for the better when the next day dawns and they can make out the shores of a remote island - until, that is, the three men discover that the island is populated by natives who prove to be extremely hostile. Taking two of the men as prisoners and throwing one to the sharks in the waters, the natives take the two survivors to face a giant lizard. 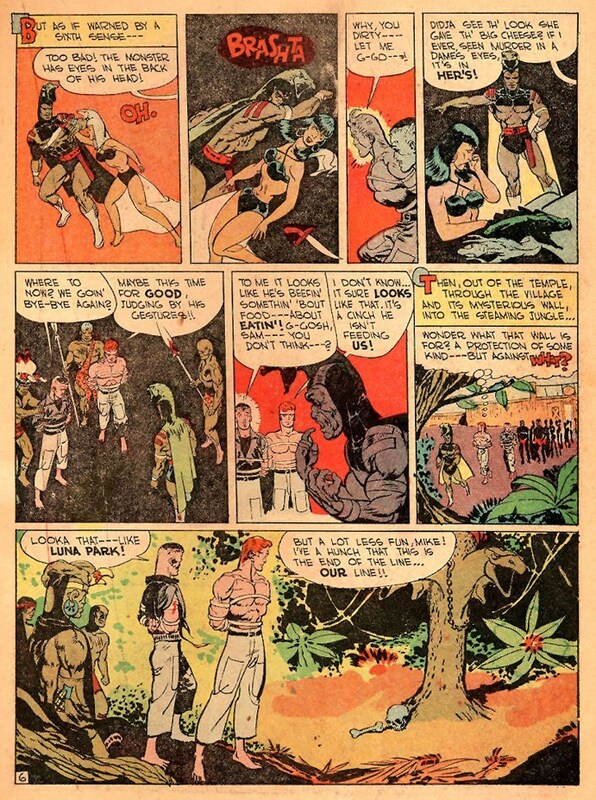 However, given the turn of events so far, the two airmen are not really impressed and their attention is drawn to two mysterious and beautiful women alongside what appears to be the chief of the tribe. 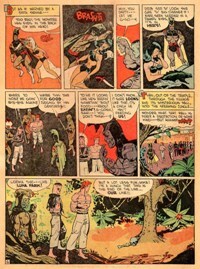 Following a skirmish and an attempt to escape, the two Americans are led into the jungle where they see evidence of previous deaths in the form of bones and skulls scattered about. Bound to a pillar with lizard heads they soon find out that a giant lizard is attarcted by their presence. 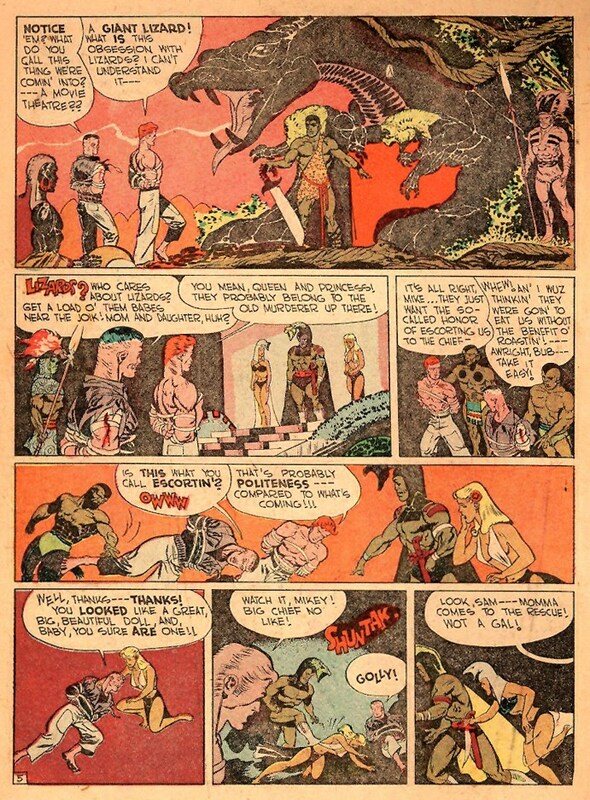 However, at this very moment the mysterious women attack the chief, free the airmen, and finally bind the head of the tribesmen to the pillar. 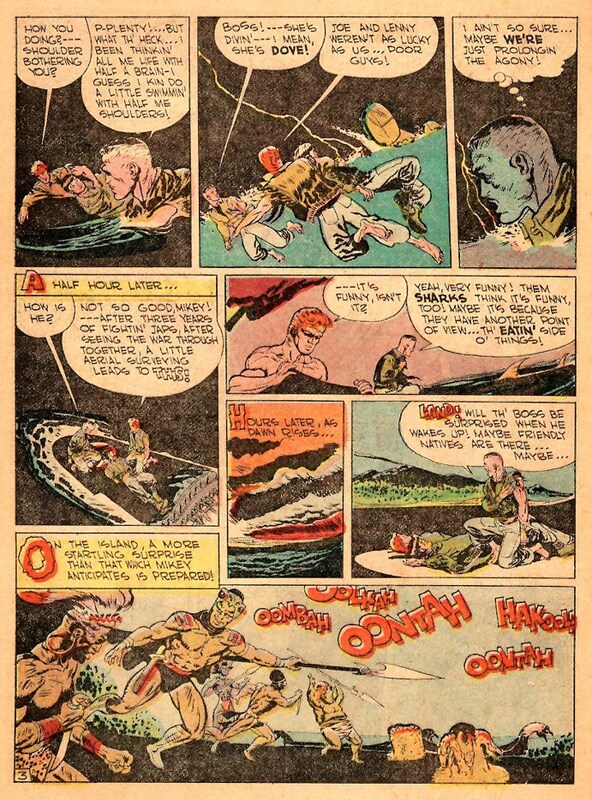 Two man-eating lizards from out of the jungle appear and feast upon the chief, whilst the two Americans are given a boat and finally make it back home to their base. 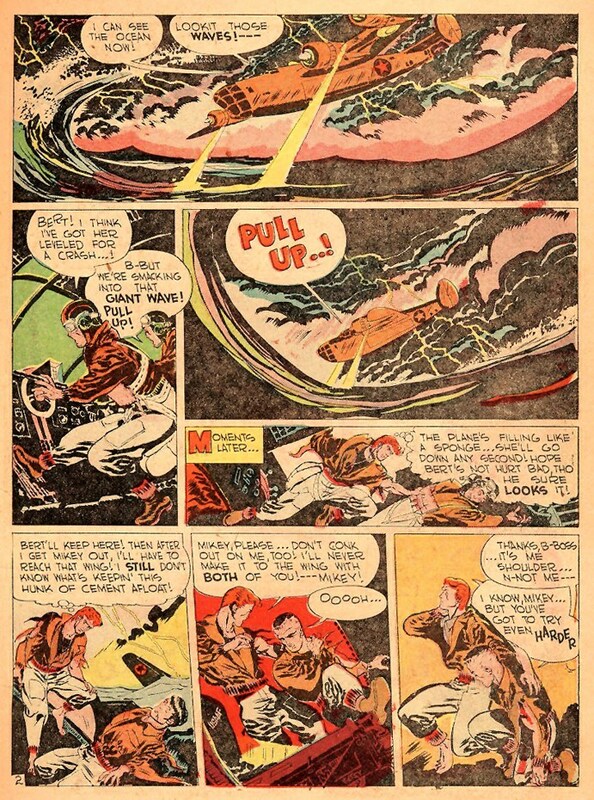 Days later, "a bomber squadron makes short work of the island's strange, bloodthirsty inhabitants". 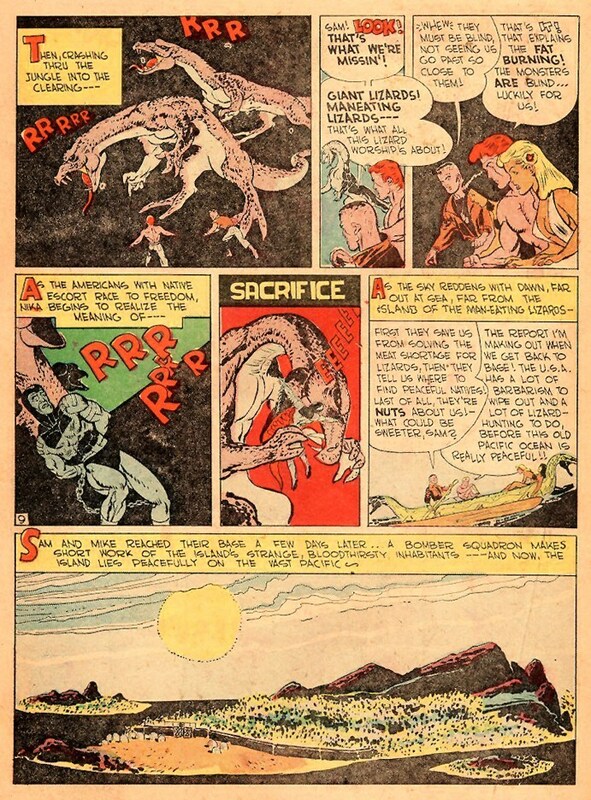 The only story contained in Eerie Comics #1 for which both the author and artist are known, "The Man-Eating Lizards" - scripted by Edward Bellin and drawn by Joe Kubert (who was 21 at the time) - is, paradoxically, also by far the weakest. Although drawing on classic motifs of fantastic fiction - castaways confronted with mysterious and dangerous creatures which seem to come straight from the period of the dinosaurs, such as in Jules Verne's Mysterious Island from 1874 - the storytelling is unsteady and in some cases downright sloppy and confusing, as far too many questions are left dangling in the air. 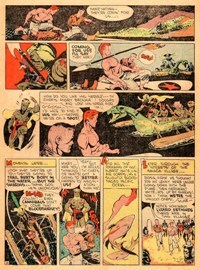 Unlike the previous stories, this is an example of a Golden Age comic book story which no longer works at all (although it was actually reprinted in July 1950 in Out of this World Adventures #1). 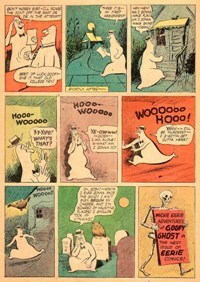 "He don't even know da foist t'ing about hauntin'!" 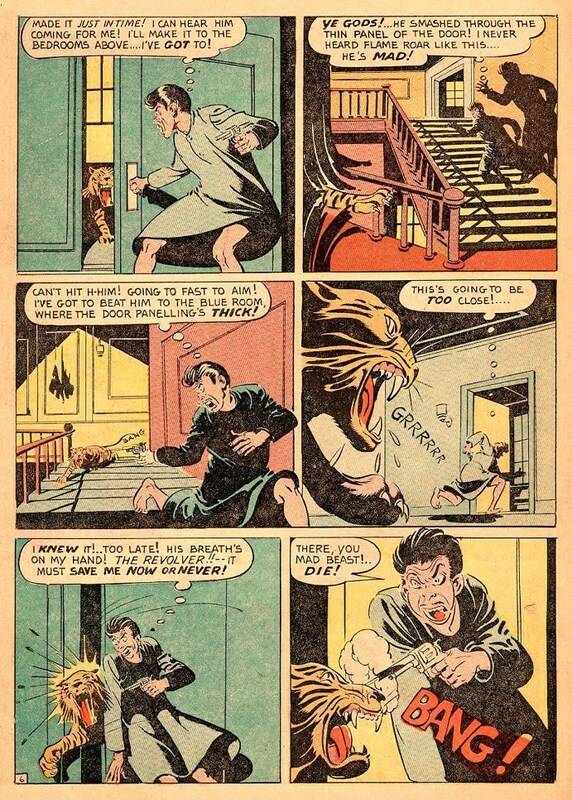 Prior to the publication of #1, comic books would from time to time feature horror themes but have them portrayed in a mood of comedy and slapstick. 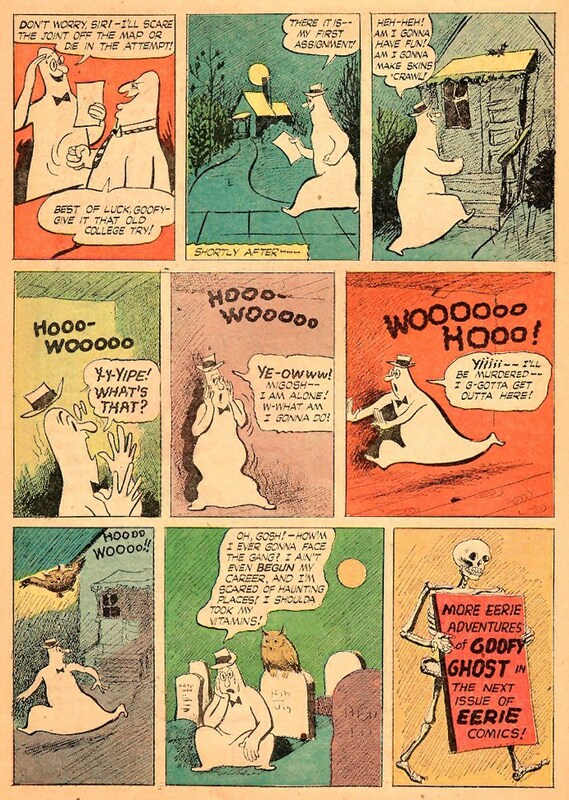 It is thus not surprising to find a two page filler providing comic relief through the character of Goofy Ghost, yet another member of the group of ghosts who are themselves easily scared by just about anything, often including themselves. "Is it possible to mistake the living for the dead?" 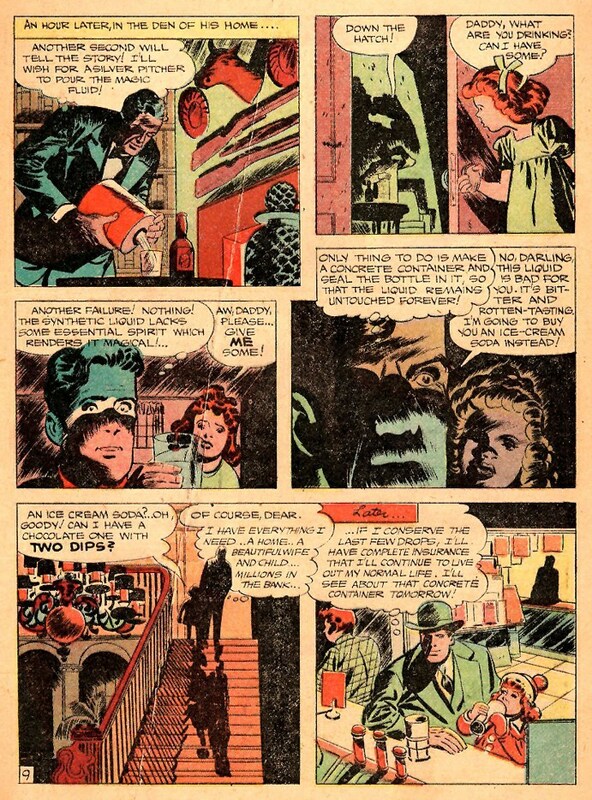 Following these two pages of comic relief, Eerie Comics #1 then takes its readers (at least those who are going through the book page by page instead of skipping thorugh - which possibly most readers actually did) on to a three page text story with illustrations. 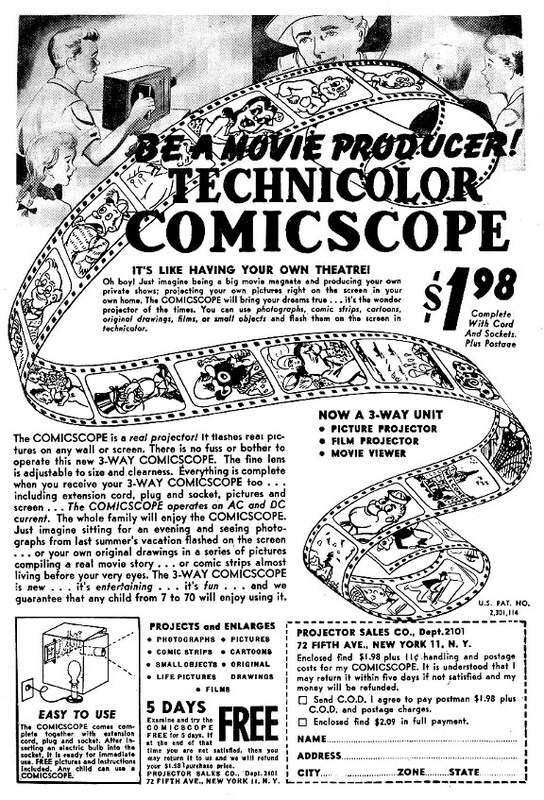 This form of content was typical for Golden Age comic books. 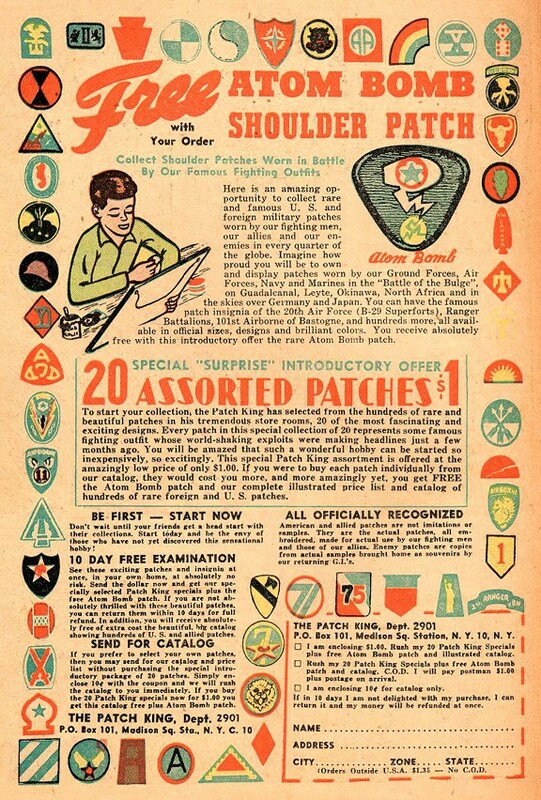 However, it was not featured to provide an opportunity for standard linear reading garnished with one or two illustrations as it might appear in any periodical or book - including this format served the sole purpose of meeting regulations to qualify for second class mailing privileges. 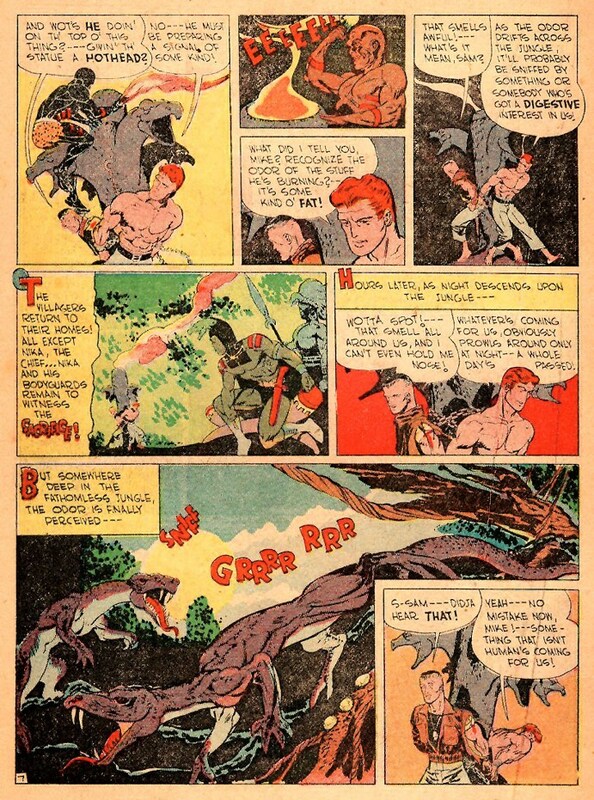 According to Post Office rules, print publications were required to include a couple of pages of text, so the publishers of comic books would do precisely that. 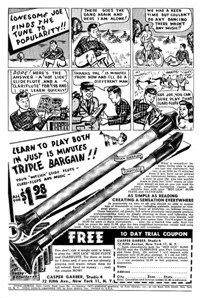 Not surprisingly, editors had a tendency of caring little to nothing about these slots which were forced upon them, and they would generally use them for what they considered to be throwaway material. 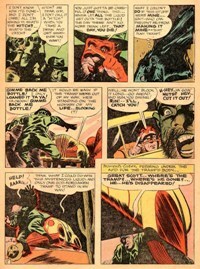 Out of this grew the golden rule that these text stories were to be handled by just about anybody other than experienced staff and writers working on the title - which is how Stan Lee got started in the business when he wrote a Captain America text fill-in. The text story in Eerie Comics #1 is typical of most text stories to be found in Golden Age comics - readable, but always somewhat anaemic and, all said and done, an odd feature in conjunction with a comic book. Editors certainly felt the same way, and when they eventually found an even cheaper way of conforming to this post office "text requirement" by way of the letters pages (Harvey, 2010), most of them did away with the short text stories. 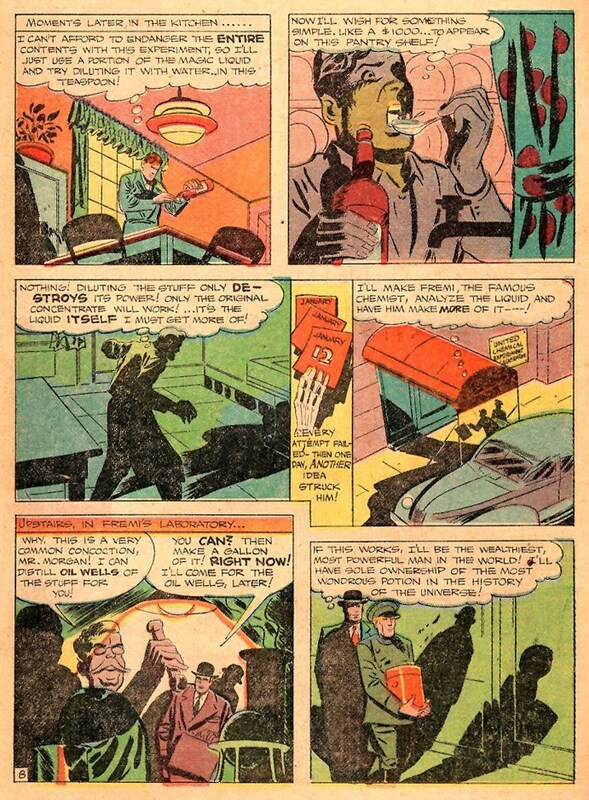 Overall, regulations regarding postal service had a fairly big impact on comic books of the 1930s and 1940s. Other than these text stories, the fact that the launch of a new periodical title entailed an expensive registration fee (in order to receive a second class mail permit) had publishers simply continuing comic book series and their numbering even if the actual title had become completely unrelated to the content, e.g. 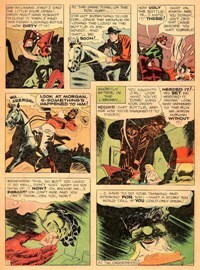 an originally "funny" title eventually featuring superhero content (such as DC's More Fun Comics which eventually featured characters such as The Spectre). "Throughout Louisina The Murder Manor was a name symbolizing terror! 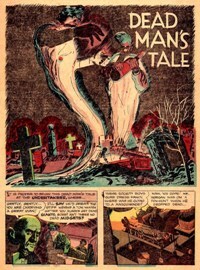 Many a dead man knew its secret, but no living man! 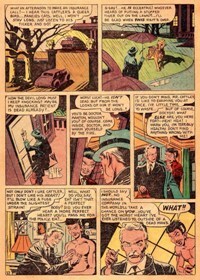 But that didn't stop Johnny and Rupert Rawlings from learning 'The Mystery of Murder Manor'!" Just as Johnny and Rupert Rawlings are exploring Louisiana's Bayou Country a tropical gale picks up and forces the brothers to look for shelter. They land on a piece of land which according to popular belief is haunted and houses a building commonly called "Murder mansion". But whilst Rupert is reluctant to stay on because, as he points out, many have entered the house but none have come out again, Johnny insists on the necessity of finding shelter from the storm. Approaching the old building, Rupert grows increasingly terrified whilst Johnny - who doesn't believe in ghosts - pokes fun at the popular superstitions. 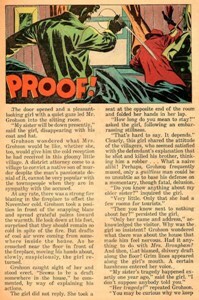 With the front door open, they both enter the mansion only to find a dead man, hanged from a beam in the main entrance hall. 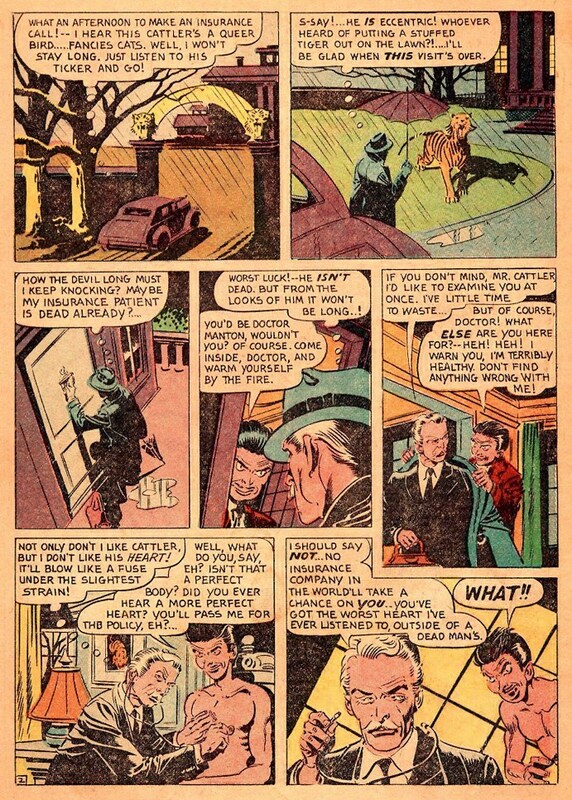 Johnny assumes the man to be dead for about a week and wonders what the circumstances of this event might be, whilst Rupert is shaking with fear. Determined to get to the bottom of all of this, Johnny is about to go up the main staircase when all of a sudden the two brothers hear an eerie voice warning them to leave this house right away - or die. 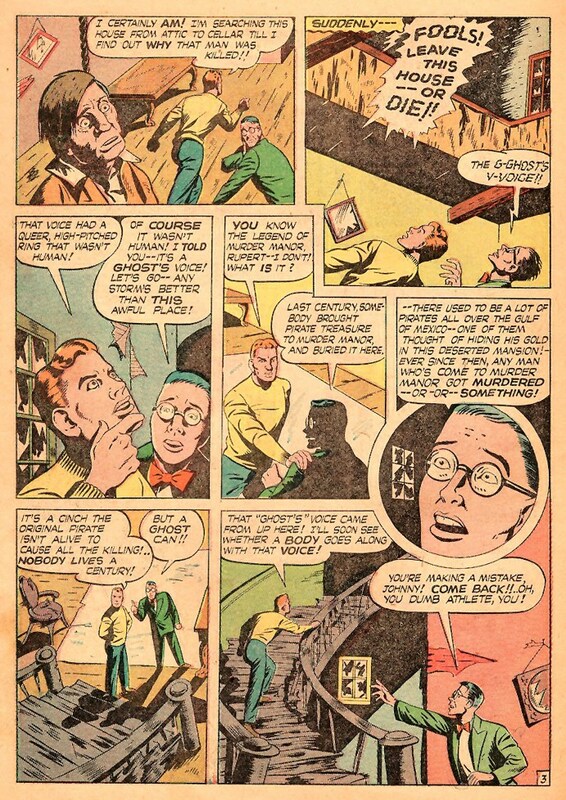 Johnny feels that the voice had a high-pitched tone which wasn't human, and asks his brother to tell him more about the legend surrounding the place. 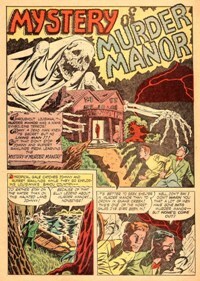 The "Mystery of Murder Manor" represents a return to the quality of storytelling contained in the first two stories of Eerie Comics #1, and although the ending appears somewhat hurried in comparison to the introduction and intermediate events, both the plot and the artwork - again by an unknown creative team - provide and maintain reader interest by quintessentially asking the question of what precisely is going on in that old house - and can it be explained through logic or is it, in fact, supernatural? In order to further underline this theme, the unknown author has come up with a fairly ingenious device as he presents the reader with two brothers who not only differ in outward terms - one being an athlete and the other a bookworm - but also in their beliefs: whilst Rupert Rawlings is convinced that only the supernatural can explain all the mysterious happenings which have taken place at this location, Johnny doesn't believe in ghosts for a second and is both self-assured and positive that there must be a logical explanation for everything. In putting forward this question - are these supernatural events or can we explain them? 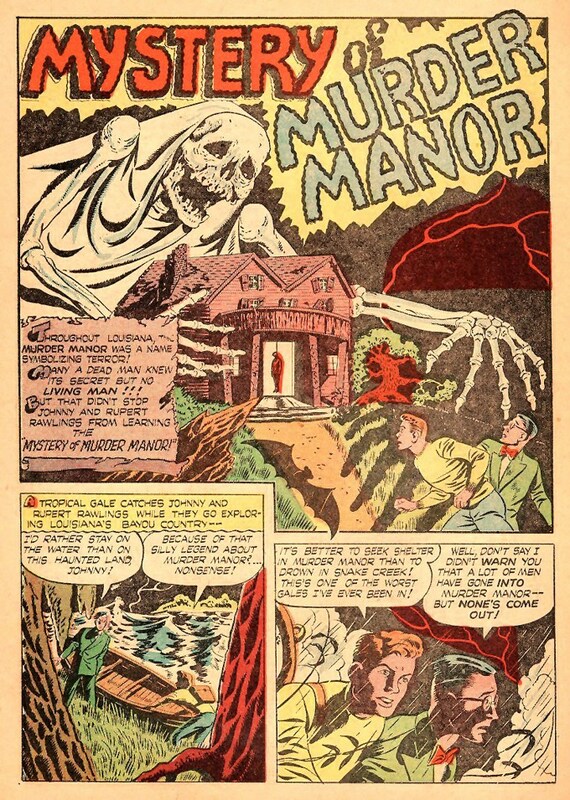 - throughout its six pages, "Mystery of Murder Manor" falls into a long line of horror fiction, and the ending - where we find that there is indeed a logical explanation for everything - makes use of the well established literary principle of the "explained supernatural" (Clery, 1999). 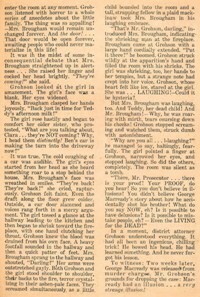 People, objects or events seem to be supernatural at first to both the reader and the literary characters, but are eventually shown to have realistic, i.e. non-supernatural explanations. 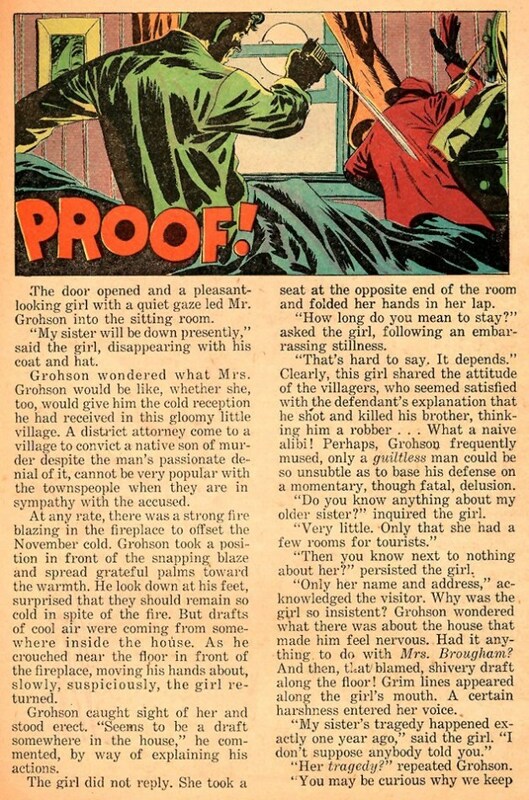 As a result, the laws of everyday reality remain intact and permit an explanation or even dismissal of allegedly supernatural phenomena; in the case of the "Mystery of Murder Manor" this basically involves a talking parrot and a mentally disturbed murderer. Sometimes also referred to as the "Supernatural Explained", this literary technique can first be found as a recurring plot device in the works of Anne Radcliffe, such as The Romance of the Forest, a novel published in 1791 which sets up suspense for horrific events which, however, all have natural explanations. In other words: fear and horror are absorbed through analysis and detection. 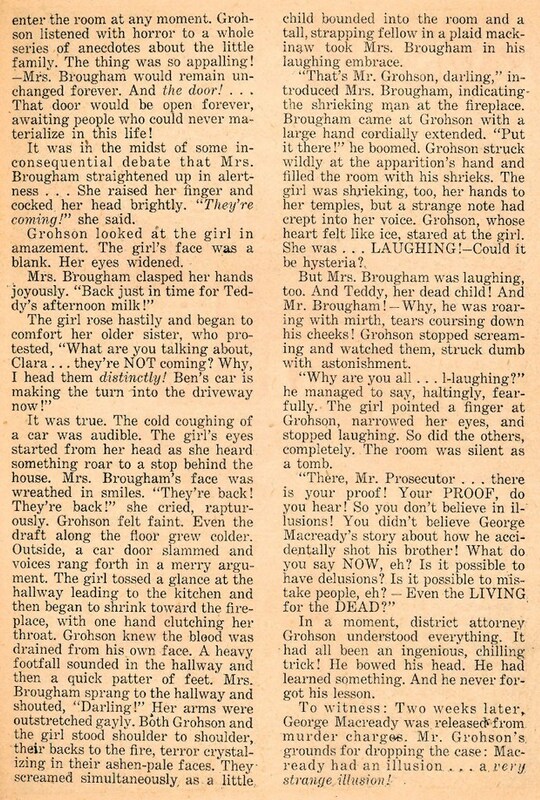 Not surprisingly, the genre of detective fiction has some of its roots in the explained supernatural, as can be seen in the modus operandi of Edgar Allan Poe's famous protagonist Auguste Dupin in The Mystery of Marie Roget (1842) and The Purloined Letter (1844) where the most mysterious events are all unravelled according to the principles of logic. "From the moment harry Horton slipped a marriage band on his wife's finger, he was at war with her! She gave him no peace, no rest, no mercy... she mocked him, criticized him, nagged him, screamed at him, struck him. He was a fool, a bungler, a failure, an imbecile! -- Nothing he ever did was right. 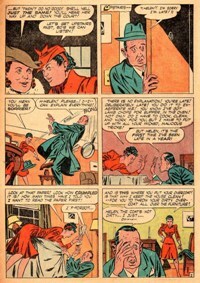 -- So, is it any wonder that things turned out so wrong in -- 'The Strange Case of Henpecked Harry'?" Although Harry Horton hurries home from work in a scurry, he is subjected to verbal and physical abuse by his wife who accuses him of playing tricks on her - even though Harry is late for the first time in a year. It doesn't stop there either, as his bickering wife puts him right on a good many other things as well. 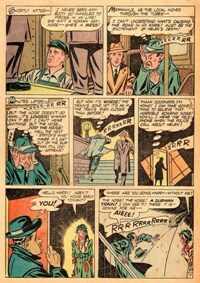 The next evening, Harry Horton gets a chum at work to punch his time card, giving him a fifteen minutes margin for a perfect alibi. 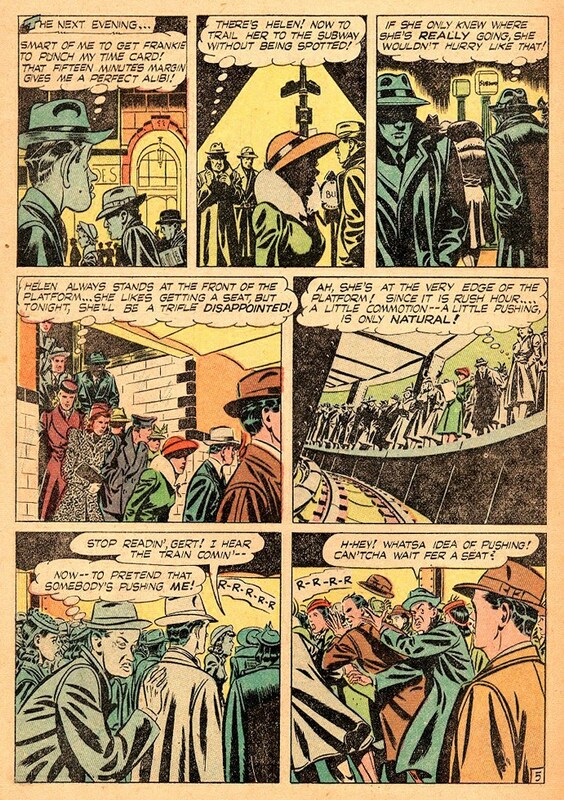 He spots his wife Helen and trails her to the subway station where she always stand at the front of the platform in order to get a seat. As the train pulls in, Harry pretends to have been pushed from behind and thus actually pushes the people standing in front of him towards the platform edge - and pushing the woman up front onto the tracks and right in front of the train. Making good use of the confusion on the platform, Harry catches a local train which will take him home just in time to take the call from the police, telling him his wife's dead. As Harry rides home he has the sensation of a roar in his ears which gets louder and louder. Glad to finally get off the train, he finally opens the door to his apartment - only to be greeted by his wife, all covered in blood. In shock, Harry turns around and back onto the stairway, and with the roar in his ears he suddenly seems to perceive a subway train coming straight at him. He hurries up onto the roof, thinking that he is going mad and seeing things. 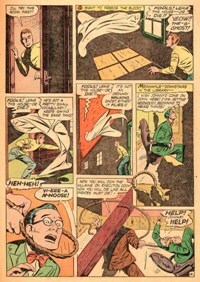 In a craze of fear and anxiety, Harry Horton falls from the roof. As Helen Horton returns from work, she is informed by her neighbours that her husband has just died from a fall. Nobody knows what he was doing up there, only that he was screaming about something nobody understood. 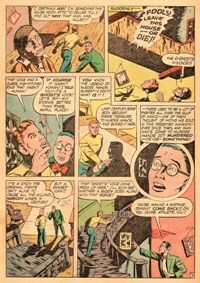 The 8-page story "Strange Case of Hen-Pecked Harry" was written by an unknwon author and drawn by Fred Kida (his signature features in the first panel), who was 27 at the time. 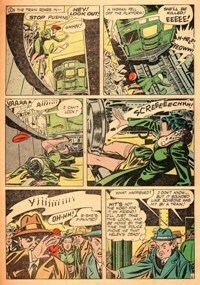 He had previously drawn Airboy for Hillman Periodicals and would later go on to pencil e.g. 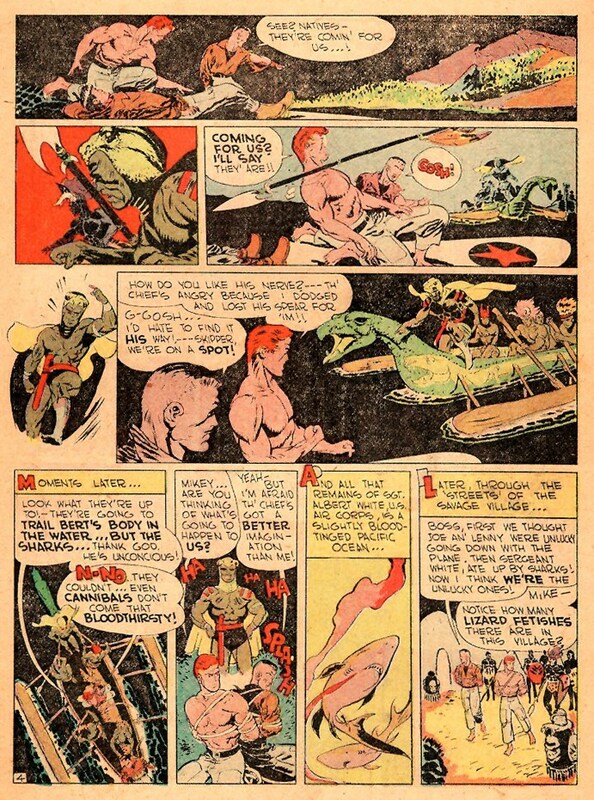 Flash Gordon in the 1950s/1960s and the Amazing Spider-Man newspaper strips in the mid-1980s. 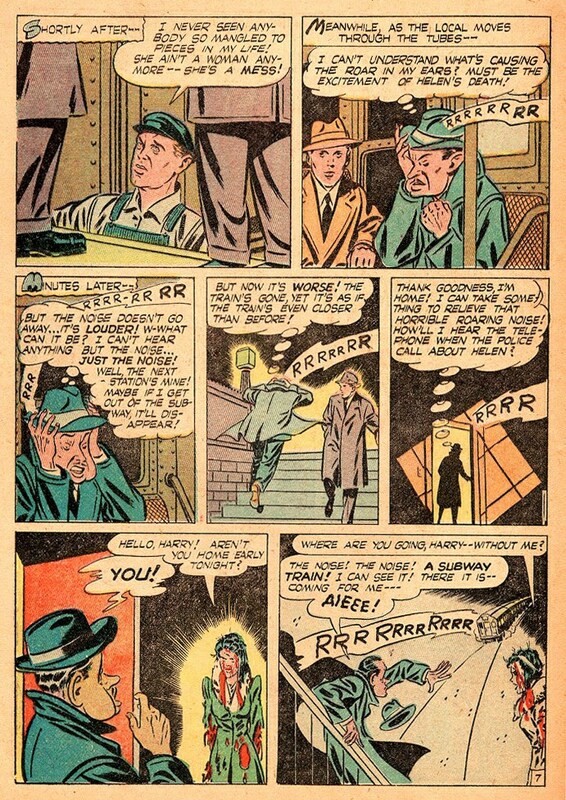 The tale of Harry Horton - the fifth and final story presented in Eerie Comics #1 - again makes use of the plot tool of having a villainous trapping eventually backfire and work against the person who has set it up, just as in the opening story "Eyes of the TIger". And once again readers also learn that anti-social behaviour, and most certainly murder, will eventually be punished, one way or the other. 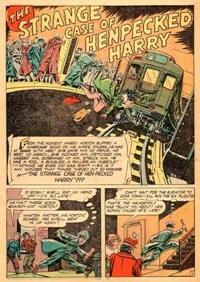 But the "Strange Case of Hen-Pecked Harry" adds yet another element to its narrative: the ploy of mistaken identities. Used extensively throughout the history of literature, it can be found for example as the main device behind the plot of the two Shakespearean plays Comedy of Errors and Twelfth Night, where the confusion of identities is effectively caused by the existence of twins. This is obviously the perfect setup to breed confusion, but in most literary examples disguises and borrowed clothing fulfill the same purpose just as well. Mistaking an individual for someone else is not an extraordinary event in real life either, and this fact of life is often used by criminal defendants in court in order to undermine evidence of guilt by asserting that an eyewitness to the crime incorrectly thought that they saw the defendant, when in fact the person seen by the witness was someone else (Chambers, 2001). The role of Harry Horton is interesting. To begin with, most readers will side with him, but he becomes a distinctly less pleasant person as the story progresses until he actually turns into a murderer. 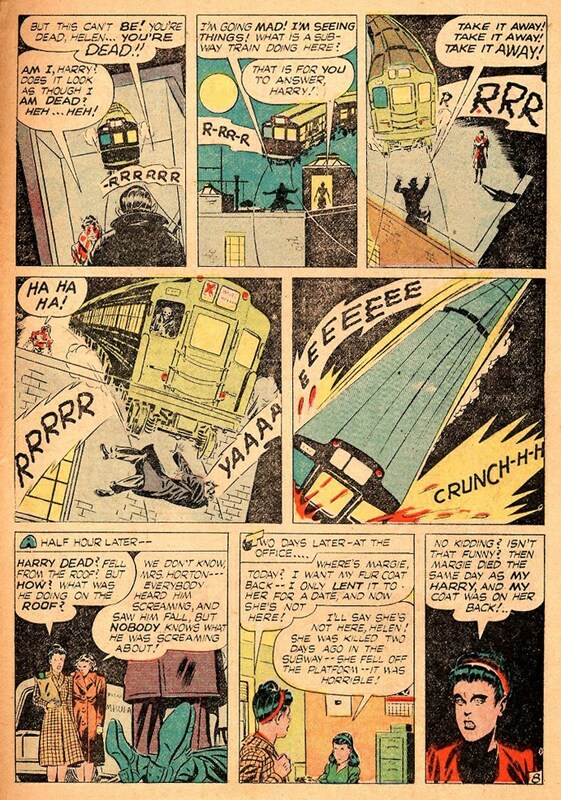 Again, although he believes himself to be smarter than others in this situation, he is quickly overcome by his nerves and eventually finds death in a rage of panic. 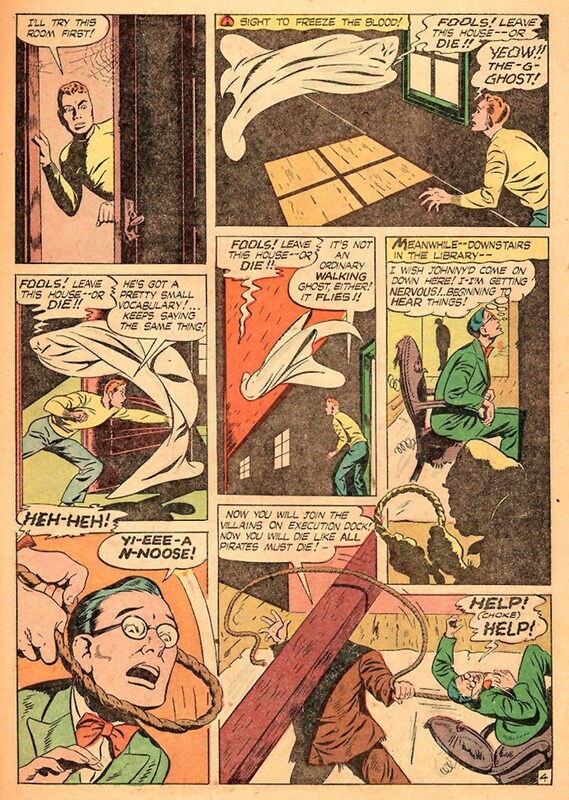 The cause of this panic is, somewhat similar to the first story, not absolutely clear: is it just that Harry can't stand up to the strain of the gruesome crime he has committed, or is there indeed a supernatural influence, such as his wife haunting him? In this case, the answer seems rather clear, given that his wife hasn't actually died. The "punchline" of the story lies elsewhere - in the case of mistaken identity, caused essentially by a piece of clothing. 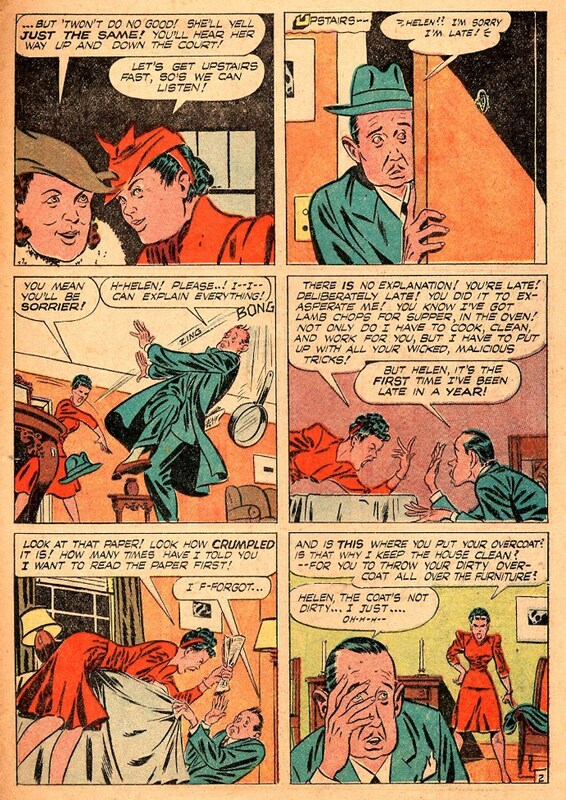 The ending is quite ironic, as it actually proves the point of the bickering wife: Harry Horton is indeed a blunderer who even screws up the attempted murder of his wife... in this respect, the "Strange Case of Hen-Pecked Harry" also fits in well with the black humour stories written by Henry Slesar for e.g. Alfred Hitchcock Presents in the 1950s. The horror fiction element in this story is comparatively small and can basically be reduced to the perceived "haunting" of Harry by what he assumes to be his dead wife. Nevertheless, the story fits a prototypical slot for upcoming horror comic books of the 1950s and 1960s where stories providing an essentially black humour punchline in the final panel would often feature a minimal allusion to elements of gothic horror in order to throw the main character off track and precipitate the story towards its ending. From an overall perspective, Eerie Comics #1 not only was the first all-horror genre comic book, but it featured several plot archetypes which would become moulds for future horror comic books. 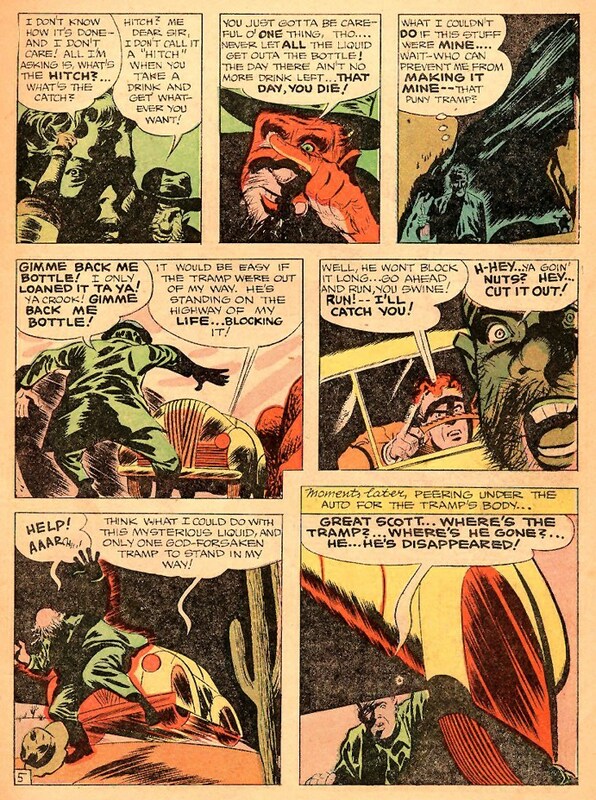 It is therefore not only import for the history of comic books as such, but it also has great relevance for both the content and imagery of what would become the genre of horror comics only a few years later, and the influence can still be seen right up to this day. 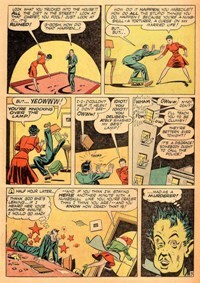 Not all "firsts" in comic book history have aged as well as Eerie Comics #1. 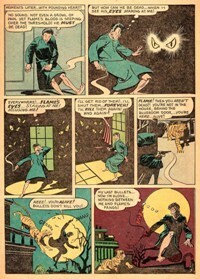 Following publication of its first issue in January 1947, Eerie Comics disappeared from newsstands shelves. 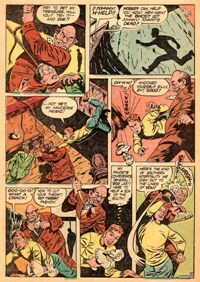 Although this happened with a lot of comic book titles from Avon - most of them were probably never conceived to be more than just mere one-shots - it does serve as an indication that the first horror-only horror comic on the American market did not create such a demand as to have Avon hurrying back to their printers to get out a second issue in order to cash in. Eerie Comics #1 was thus the first of its kind, but it didn't establish the genre as such. 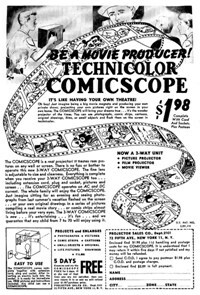 This, however, is hardly surprising as sales on the American comic book market of the late 1940s were shifting towards a completely different line of contents. 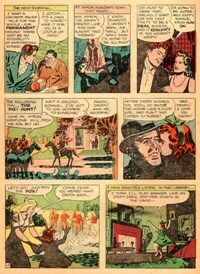 Whilst crime as well as Western comics remained popular (with the interest in superheroes dropping sharply), the industry found a new and promising sales potential in the newly emerging genre of romance comics, and by the end of the 1940s some publishers (such as Timely) were directing two thirds of their titles at a female readership (Robbins 1999). 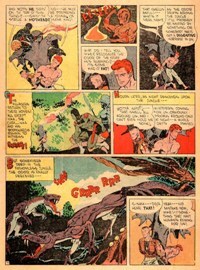 Avon did eventually bring the title back in May 1951, this time shortened to Eerie and starting out at issue #1. Published on a bi-monthly basis, Eerie saw a run of 17 issues before merging with another Avon title, Strange Worlds, in October 1954 for issue #18. 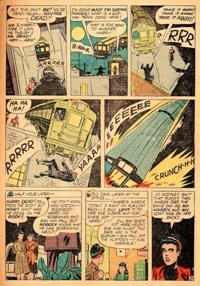 There was little to nothing there to remind anyone of its predecessor from 1947, except a reprint of "The Strange Case of Hen-Pecked Harry" which was retitled "The Subway Horror!". 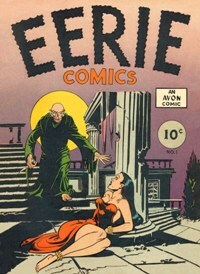 However, Eerie Comics #1 led the way for others to follow long before Avon returned to the genre. 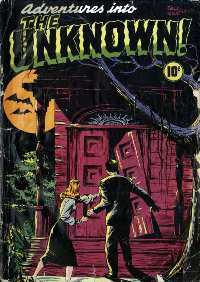 In the autumn of 1948, B&I Publishing (American Comics Group) published Adventures Into the Unknown, which would become the first regularly published horror comic book. 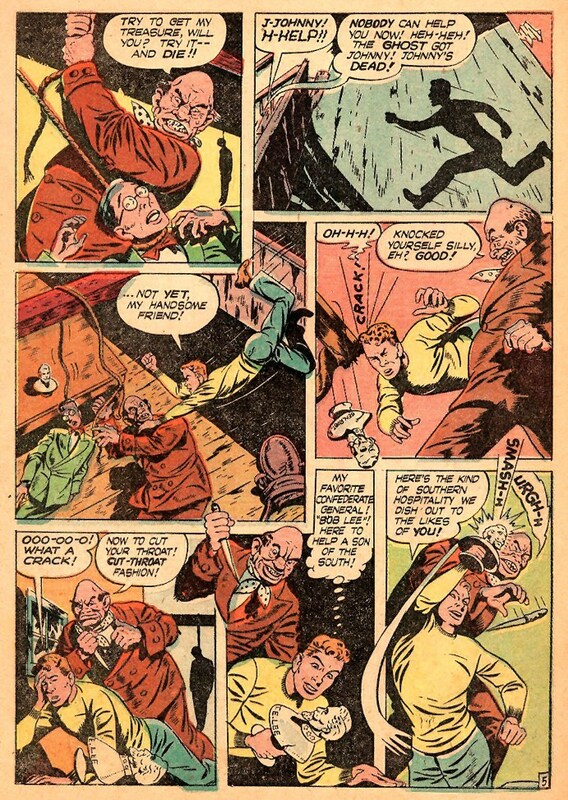 Content was often restrained and based on traditional material, and Adventures Into the Unknown #1 featured an adaptation of Horace Walpole's classic gothic novel The Castle of Otranto. However, the title turned out to be a lasting success and eventually clocked up a run of nearly twenty years (Goulart, 2001). Horror comics would take a devastating beating in the context of Fredric Wertham's anti-comics crusade (Vassallo 2011) and the 1954 hearings of the US Senate's subcommittee to investigate Juvenile Delinquency Hajdu, 2008), but ultimately the genre could not be kept down and would enjoy renewed success in the late 1950s, the late 1960s and the early to mid-1970s, despite the instigation of the Comics Code (Nyberg, 1998). 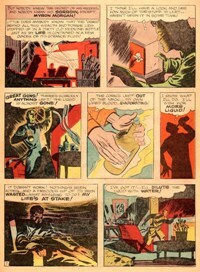 And it all began with Eerie Comics #1. 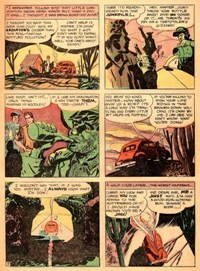 For those interested in the follow-up developments of the comic book horror genre, Tillmann Courth provides a comprehensive portrayal and analysis of 1950s horror comics which includes entire stories (now in the public domain) scanned and presented for reading on his Fifties Horror website. 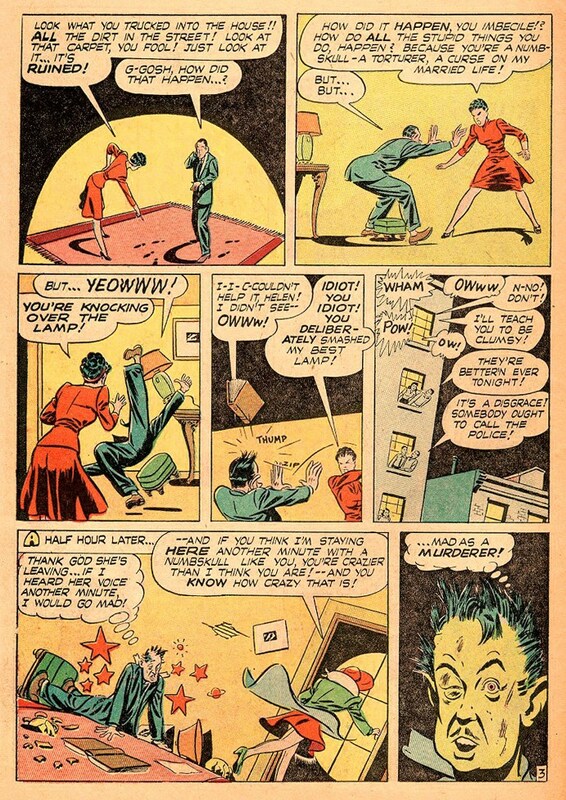 Whilst this is in German, his other two websites (Ace Horror, spotlighting ACE, publishers of 1950s horror comics, and Fiction House & Standard Horror which portrays two publishers of 1950s horror comics in detail) are in English. These are clearly go to websites for anybody interested in the topic - and they are fun reading, too.